Rockwell Group, New York. The new Andaz hotel in Hawaii will have a Grand Spiral Staircase. All wood elements of the staircase are being built by Pure Timber LLC in Gig Harbor WA during 2012. The staircase features a steel core, solid hardwood hull, treads, risers and handrail. The bent glass balustrade is being built by a partner company. Staircase contractor is Workspace11. Kohn Pederson Fox Associates New York, for owner Goldman Sachs, the Conrad Hotel is located in Battery Park across from the World Trade Center Memorial. 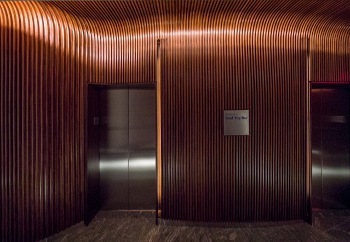 Pure Timber built the 46' long curved wall elevator lobby adjacent to the reception desk. 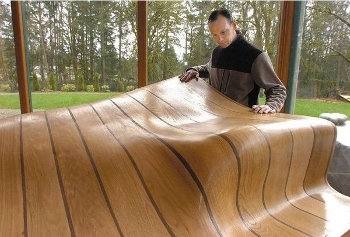 It looks like a tunel of curved walnut. Millwork contractor is Patella Woodworking. 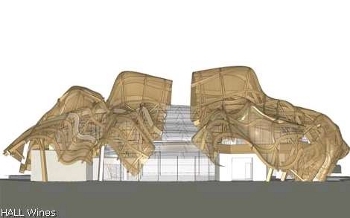 Gehry Partners, Los Angelas for Hall Wines. Frank Gehry designed trellis for Napa Winery. Prototype built by Pure Timber, Gig Harbor, WA. Composed of 4 layers of interlocking solid white oak 2" thick x 8" wide using Pure Timber's proprietary Extreme Wood Bending™ technique. Location of fabrication: St Helena, California. Rogers Stirk Harbour + Partners (RSH-P) and Martha Schwartz Partners for Parc 1, Soeul, South Korea. The fifth floor 65,000 sq ft bamboo forest was designed to utilize Pure Timber's Extreme Woodbending techniques by producing a curved deck of solid red oak. The red oak bends to form benches, amphitheaters, cafes and columns. Shown is first prototype module, one of 1,200 modules designed for this mixed use indoor landscape. Cherner Chair Company - Norman Cherner taught at Columbia University and the Museum of Modern Art in New York from 1947 to 1949. 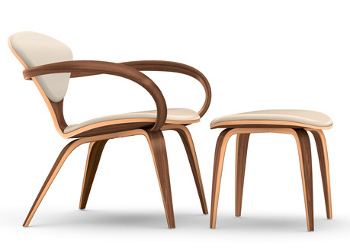 The Cherner Arm Chair was first built in 1958, and was reissued by the sons Thomas and Benjamin in 1999. Pure Timber LLC manufactures the complex, one piece, bent and twisted arms for the Cherner chair in Gig Harbor, Washington. Hamilton Grange National Memorial - US Departement of the Interior: National Parks: Historic Homes: New York City: Alexander Hamilton, one of the founding fathers of the United States, lived in a NY mansion that is now owned by the US Park Service. 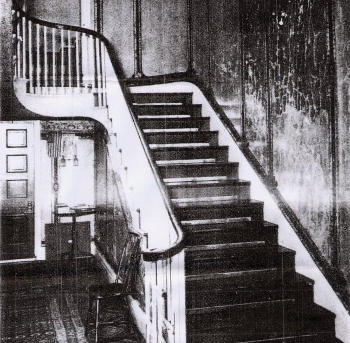 The original curving staircase was replaced a century ago in a non-historic preservation. The current preservation rebuilt the original staircase with bent stair rail components fabricated by Pure Timber LLC in Gig Harbor, Washington. The components include a 180 degree turn, two 90 degree turns and a rising volute in custom bends, twists and profiles. All of these components have been Extreme Bent from thick, solid Walnut. 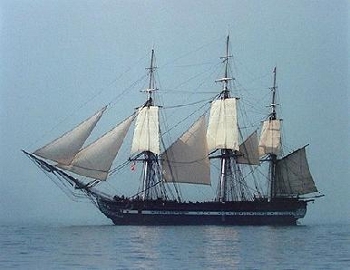 The USS Constitution uses Cold Bend™ hardwood mast hoops in Red Oak. When steam bent parts were being made for the ship, failure rates of 80% to 90% were experienced. The failures were eliminated with Compressed Wood while increasing quality and strength of the finished product. Fabricated by Pure Timber customer Pert Lowell Co. Drum Workshop Inc. A completely new musical instrument is developed exclusively with and for DW Drums. 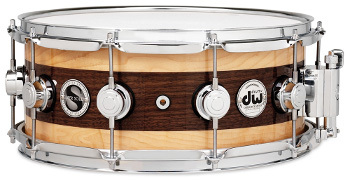 Never before has a bent 1" solid hardwood shell been possible to construct. Using our proprietary engineered hardwoods to manufacture this product has allowed for an increase in pitch without the dead sound of thick glued laminations. Watch the Video DW Super Solid Story. What fans are saying .... "The shell is handcrafted to perfection"
"I love that snare! I'm in love!!! " "I have to get this, this is my must have before I die item now" "That's amazing...I want one of those!" "I have to have one of these snare drums even if it means selling my car!" "I can whole heartedly say this is simply the best snare I have ever heard in both a live setting and a studio setting. It just does everything well! Tuned high it cracks like nothing else and tuned low it sounds really fat and full. imagine thunder and you're pretty close. It is epic! MartinLogan electrostatic. It is a special breed of speaker, capable of extraordinary, compellingly realistic reproduction. In certain crucial respects, good electrostatic loudspeakers are just better than anything else available. Hear MartinLogan electrostats, properly set up in a good environment, and the difference will be immediately apparent - no explanation required. 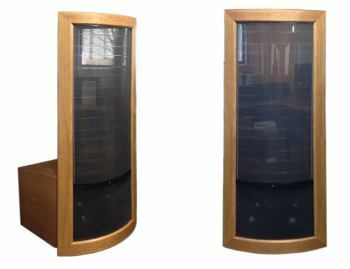 Pure Timber LLC is a supplier of curved solid hardwood components to Martin Logan. Shown is a prototype for one of MartinLogan's largest electrostatic speakers - a new aniversary issue. The electrostatic mesh is sandwiched between a double frame of solid cherry bentwood components, nested to fit precisely with the electrostatic panel. Teroforma: It has been said that simplicity is the ultimate sophistication. We agree. And that’s why we were delighted to connect the masterfully reductionist London-based designer David Weatherhead with Chris Mroz, a Washington-based inventor and published research scientist, who has developed a proprietary Extreme Wood Bending™ process. This is the first use of the EWB process for product design and it comes in the form of our commission of David Weatherhead’s supremely simple and useful Loophole Tongs. Perfect for anything from salad to cold cuts, from toast to steamed vegetables. One seamless piece of carefully selected North American hardwood, elegantly shaped and loaded with the natural “elastic potential energy” made possible by Chris’s process. 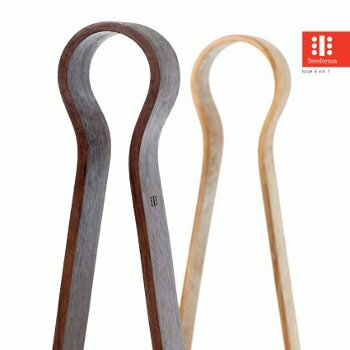 Designed with simplicity and ease of use in mind, the tongs have a pedigree and presence that make them feel inevitable in any setting.